For some reason this guy keeps asking me if i feel lucky. The results of my last few trips to the casino should convince him that no, I do not. Did you know that Clint Eastwood’s first movie role was an uncredited part in the movie Revenge Of The Creature, which was the first episode of Season 8 of Mystery Science Theater 3000? Revenge of the Creature marks the screen debut for Clint Eastwood, who appears uncredited as a lab technician named “Jennings” early in the story. 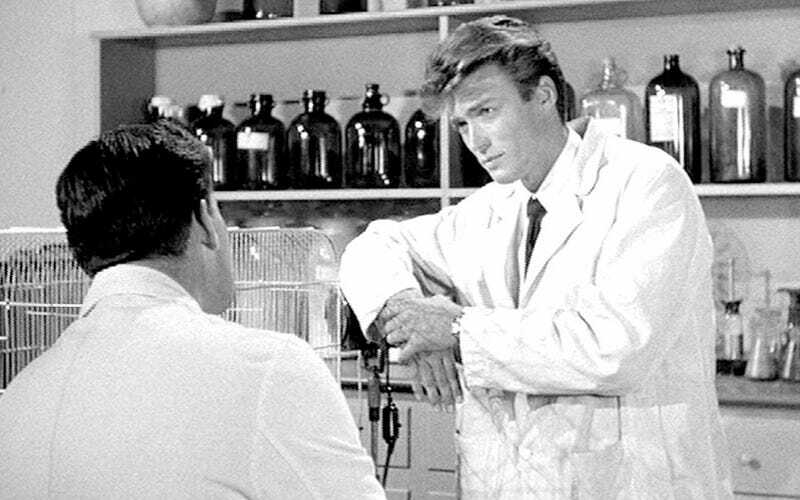 He is shown having a discussion with Professor Ferguson, accusing a test subject cat of eating a lab rat, only to find that his character had in fact accidentally put the lab rat in his lab coat pocket. I also found a story from Examiner.com detailing Clint’s first scene. Director Jack Arnold wanted the whole scene cut from the movie. In 1955, Clint Eastwood’s first screen role in Revenge of the Creature, the sequel to Creature from the Black Lagoon, almost didn’t happen. Eastwood plays Jennings, a lab technician working on an experiment to try to prove that normally predatory animals who are well fed will not attack. His character thinks the experiment has failed because one of the rats in the cage with a well-fed cat has disappeared, but moments later he finds the missing rat in his lab coat pocket. Clint would go on to bigger and better things and MST3K would go on for three years on what later became SyFy aka that network that airs dumb shark movies and wrestling. Here is the scene in question. That’s all i got for this week. I hope you all have a wonderful weekend and I will be back next Monday for a new set of fascinating trivia here at Fact Of The Day. Fact Of The Day is the daily column where RobGronkowski’sPartyBusDriver shares some random tidbit of science fiction, fantasy or horror knowledge. If there is a show or movie you would like to see done, leave a note in the comments below. You can see the full archive of past columns here.